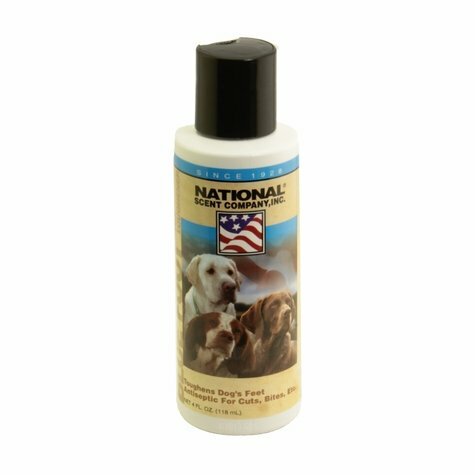 Blue Foot Pad Conditioner -- 4 oz.. $6.95. Wonderful product! Works great and fast! "Blue Foot seemed to help"
Blue Foot seemed to help, but the cracks in Jake's feet seem to be slow to heal. Have not used it all that much to really tell yet. Blue Foot Pad Conditioner -- 4 oz. Good way to toughen and protect your dog's feet for hunting on hard ground, rocks and ice. Also works as an antiseptic for scrapes and minor cuts. Shake well. Daily application toughens feet. Light application twice weekly maintains toughness. Apply double application before hunting, field trial, or agility training. Apply daily as antiseptic for cuts, bites, etc. Keep away from eyes. Keep out of reach of children. For external use only.